Home Tutorials SiteGround Why Is SiteGround So Expensive? Why Is SiteGround So Expensive? At this moment, SiteGround is one of the best web hosting providers in the world. There’s no denying to that. As a result, you might have made a decision to get a web hosting account with them. But, you think there’s a problem here. It seems to you that SiteGround’s web hosting plans are somewhat expensive. This is a valid argument. We are with you on this. SiteGround actually is a bit expensive compared to their competitors when it comes to the high-end web hosting plans. And, there are a number of legitimate reasons behind their expensive plans. Because of that, we believe that it is really worth it even if you get the expensive web hosting plans of SiteGround. The data centers of your web hosting provider can have a great impact on your website’s speed and performance. You should know that it is better if the distance between the data center and the majority of your website’s visitors is less. Thus, the information from your website will be delivered to the visitors quickly. To tackle this problem, SiteGround has built 4 data centers all around the world. They are located in USA, Netherlands, UK, and Singapore respectively. So, you can see that they have covered most of the world. You can choose your desired data center while opening a web hosting account with them. 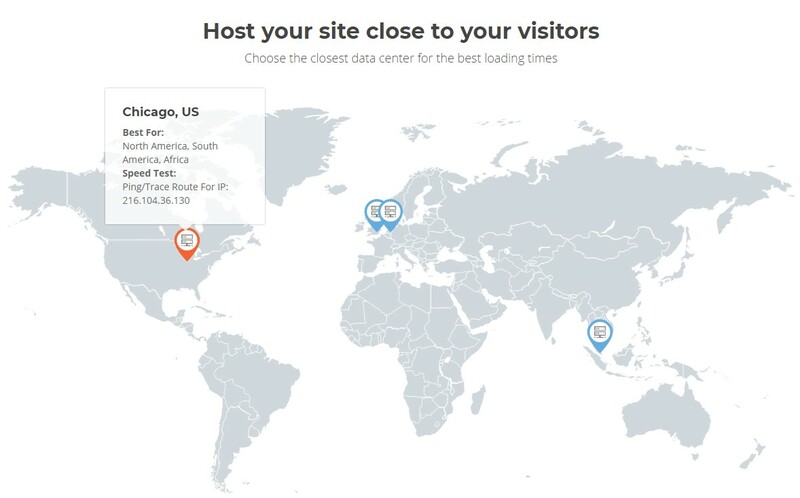 So, if you receive visitors from Asia, you can choose the data center in Singapore. Most of the other web hosting companies don’t have more than a couple of data centers. In contrast, SiteGround has 4. The cost to maintain these data centers is enormous. It is not easy to manage 4 data centers from all corner of the world. However, SiteGround is doing it without any issues. They have redundant electrical systems. So if there is a power failure, their data centers will be up and running with the help of backup power feeds. Even if those backup power feeds fail, they have their own UPS and generators which can do the work. For that reason, they can maintain a high uptime. The security in those data centers is also rock-solid. They have 24/7 human security forces. Added to that, they also set up biometric access systems, bulletproof lobbies, access control man traps, 24/7 video surveillance in those data centers. It is to make sure that the data of their customers remain safe. All of the hardware and software on those data centers are updated on a regular basis as well. SiteGround is monitoring all of their active servers constantly. They have invested a lot on their servers so that they can provide hassle-free services to their customers. 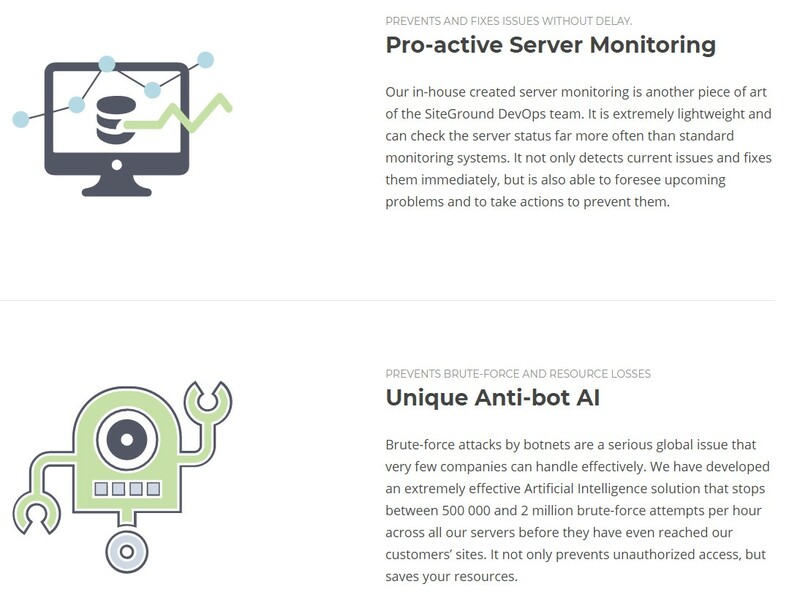 They have set up their own unique Anti-bot AI, which helps to keep away any type of brute-force attacks from their servers. This AI bot single-handedly halts about 500,000 to 2 million of brute force attempts hourly even before they have reached to any of their customer’s websites. This just the tip of the iceberg. They have a lot of similar technologies which are always active and monitoring all of their servers. If you don’t want to lose visitors on a regular basis then you should get a web hosting company with good uptime record. We have researched a lot of web hosting companies. 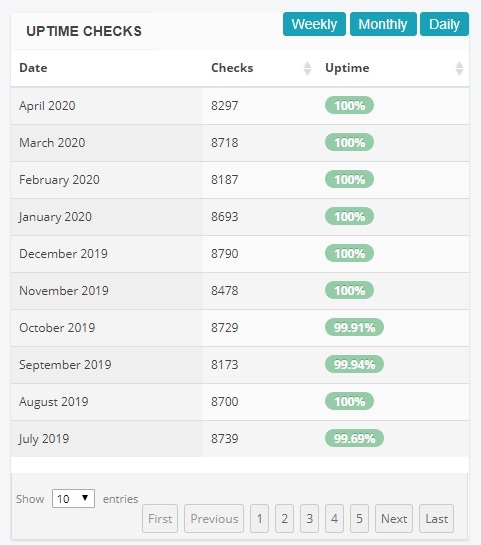 But till date, we haven’t found any other web hosting companies which can compete with SiteGround in terms of uptime performance. After a lot of research on this field, even we have decided to use SiteGround as our web host. You might already know that we use SiteGround to host this website (ReveiwPlan.com). We are very content about the performance of SiteGround. You can see the uptime record of our website in the image above as a shred of evidence. They have been keeping 99%+ uptime from the beginning and it has not gone bad for a moment. It also costs a lot to keep all of their servers up all the time. The days of HDD are over. Now is the time of SDD. SiteGround has been offering free SSD storage solutions with every web hosting plans of them. It can dramatically increase the loading speed of your website. Case in point, most of the other web hosting providers charges extra for SSD web hosting. With every web hosting account of SiteGround, you will get free Cloudflare CDN. You will also have the option to upgrade to the premium version anytime. CDN can also improve the speed of any websites to a great extent. If you want to deliver your website content to a returning visitor faster, you would need a caching system in place. SiteGround has its own built ‘SuperCacher’ plugin for WordPress, Joomla, and Drupal etc. It is also free. It can help your website load faster by optimizing through Memcached. SiteGround uses the NGINX (a web server technology) to load the static content of the websites of their customers. Along with that, they offer HTTP/2 and PHP 7 which are also very helpful for a faster website. In case of implementing some of these speed technologies, SiteGround was the pioneer. Nowadays, a good customer support team is very rare. We have tested a lot of web hosting companies. And we have always come back to SiteGround because of their high-quality customer service. They are available 24/7 via live chat, direct phone call, tickets, email etc. Although they are a Bulgaria based company, they are offering customer support in English. You will always get an instant response from their team if you use the live chat option. An email will take less than an hour to be resolved. Moreover, they are very friendly and approachable to their customers which is very rare in recent days. Even if you are not one of their customers, you will get help from them for free. Taking a backup of your website should be one of the topmost priorities of you. SiteGround also takes it very seriously. And, they offer free daily backup (automatic) with every web hosting account. SSL certificate is a must have for any websites nowadays for security reasons. But, most of the SSL certificates are costly. Thus, a lot of website owners can’t use this. Fortunately, SiteGround is offering free SSL with every web hosting account. If you want to switch your web hosting company it can be a little hectic. Just for this, a lot of people don’t want to switch to a new web hosting company. But, if you want to SiteGround you don’t have to worry about any complications. Because SiteGround offers free site migration. They will migrate your site from your former web hosting company without any problems. SiteGround has a lot of security measures already set up on their servers. For instance, they have a technology called ‘Account Isolation’. This is built by their own security experts. This feature will keep each and every account separate even in shared hosting plans. Thus, even if a single account gets hacked, other accounts on that server will be safe. They also keep track of software vulnerabilities on a daily basis. They write their own firewall custom rules weekly. On top of that, they also have a proactive monitoring system which can detect a lot of vulnerabilities automatically. SiteGround always update all of their web hosting related software’s whenever a new version comes. So, you won’t have to worry about the security of your website if you are with SiteGround. And, they are spending a fortune for keeping their customers safe from any type of cyber-attacks. If you take a look at the services offered by SiteGround and compare these to its competitors’ services, then it is evident that SiteGround is not expensive. Rather it is the exact opposite. In reality, SiteGround is offering many premium features for free some of which are not even available from other companies for additional fees. We hope that now you know why SiteGround seems so expensive compared to other web hosting providers.